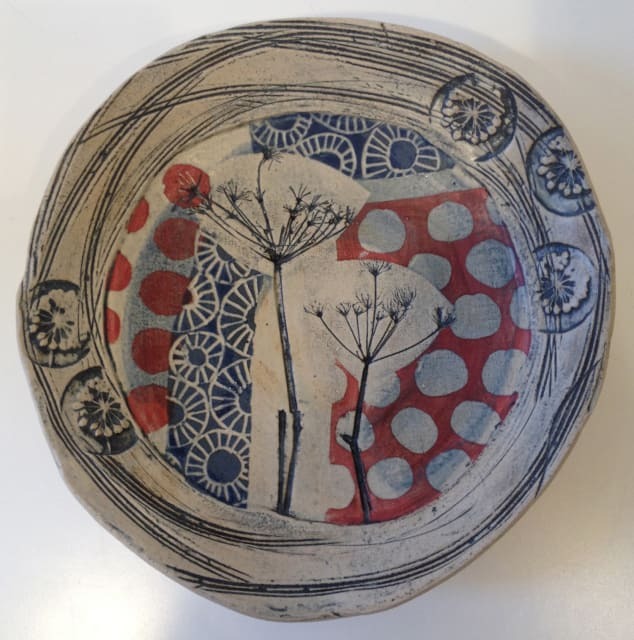 Based in the Gers, South West France, ceramicist Mollie Brotherton's work is strongly informed by her surrounding countryside and the changing seasons. The landscape of the Gers is known for its undulating, rolling countryside, populated with ancient woodland and edged by the mountains of the Pyrenees, Mollie loves the shifting variations in colour of the land, and the hedgerows filled with wild plants and flowers. For Mollie, the use of clay is the perfect conduit for expressing the textures and colour of her environment. She uses a variety of techniques, but slab-wear is at the core of what she does, making each of her vessels unique. She begins by rolling out slabs of clay, pressing in flowers and seed heads, found objects and hand-made blocks, before the pot itself takes shape. Once fired, she uses a range of glazes, slips and wax resists, applied in layers to enhance the textures and forms. Mollie has worked with clay since 1997, exhibiting her work all over Europe and the UK. Her inventive style is constantly evolving, as she experiments with varieties of shapes and glazes.